Even though India’s official growth projections are often exaggerated, the Prime Minister, Dr Manmohan Singh’s figure of 7 per cent growth is more realistic than that of the RBI and the Finance Ministry, which expect the GDP to grow at 7.5 per cent this fiscal year. Private analysts are less optimistic and do not expect India to achieve even 7 per cent growth. Once considered a horror disease, tuberculosis (TB) in the closing part of the last century seemed to give in to modern drugs and treatment strategies evolved globally. But it has just delivered a shock in the form of a new “Total Drug Resistant” (TDR) variety that responds to no medicine. Putting the patient in a sanatorium as in the olden days may be the only way to handle such cases. Who is more powerful in Pakistan today? The obvious answer would have been the military had the question been asked a few years back. The situation seems to be changing with the elected civilian government trying to assert its supremacy. In fact, there is a war of attrition going on in Pakistan between the government on the one side and the judiciary and the army on the other. The latest move by the government is a Cabinet approval to amend the law to force those associated with the judiciary and the military to declare their assets every year to ensure probity in public life. The new law covers all civil servants, judges and military officials. Trust the government in general and the Ministry of Defence (MoD) in particular to disparage the armed forces’ image at the slightest pretext. In the last few years, this seems to have become a norm. The latest is the way a simple issue like the age of Gen V.K. Singh, the current Army Chief, has been made a highly controversial issue. It has been extensively debated in the media for nearly the entire tenure of the Chief, when it could easily have been sorted out as a matter of routine. It is for the third year in a row that the Marist College Institute for Public Opinion, New York, has found through a survey that “whatever” as a pause-filler is used in casual conversation is the most annoying word. Thirty eight per cent of the adults surveyed voted for that. Another 20 per cent were not happy with the use of ‘like’ while 19 per cent could not stand the phrase “you know”. From the elite to the common man, it is an open secret that the de jure constitutional PPP rulers share power with the de facto unconstitutional military co-rulers in Pakistan. Regardless of the truth about the controversial memo, the case provided a golden opportunity for the military establishment to further its policy of increasing its de facto power through political destabilisation. ALL the elements of high judicial drama were in place. A case instituted by a former prime minister and the foremost opposition leader today, regarding an allegedly treasonous memo involving the Americans; a memo co-authored by an American supposedly with the Pakistan Ambassador in America, allegedly with the consent of the Pakistan President, involving a conflict between our de jure civilian rulers and de facto military rulers; replies submitted in the Supreme Court by army and intelligence chiefs without the consent of their civilian constitutional superiors. AS a person who lives immersed in the news media, every now and again I find myself reacting with surprise to the fact that Pakistan, such as it is, continues to work in some very basic ways. Even though India’s official growth projections are often exaggerated, the Prime Minister, Dr Manmohan Singh’s figure of 7 per cent growth is more realistic than that of the RBI and the Finance Ministry, which expect the GDP to grow at 7.5 per cent this fiscal year. Private analysts are less optimistic and do not expect India to achieve even 7 per cent growth. For a country long used to what is contemptuously called a Hindu growth rate of 2-3 per cent, it is no mean achievement to maintain this level of expansion. Much of the credit for the accelerated growth goes to the economic reforms initiated by Dr Manmohan Singh as the Finance Minister in the 1990s. One can appreciate the Indian reality more if it is seen in the global context. In 2008 when the US sub-prime crisis caused a global financial meltdown and the collapse of certain prestigious financial institutions like Lehman Brothers, India escaped with bruises. The year 2011 again saw the European Union struggling to bail out Greece. Other members like Portugal, Ireland, Italy and Spain too cried for similar packages to cope with their sovereign debt. The US recovery got threatened by a political standoff over taxes and debt. China and other emerging economies also felt the heat. For India the chief villain was high inflation, partly fuelled by rising global oil prices. To counter it, the RBI tightened money supply and hiked interest rates, slowing down demand for houses and consumer durables. The over-all GDP growth took a beating as capital outflows hit the rupee. The government got its share of blame as corporate India criticised the prevalence of what it called “policy paralysis” in the country. The opposition parties and Trinamool Congress too should own their contribution to policy inaction as they did not let Parliament function much of the time and resisted reforms. Corruption along with petty, frequent political squabbling has dented the country’s image, affecting foreign investment. What needs to be done is clear. But will India’s politicians give growth a chance in the New Year? Once considered a horror disease, tuberculosis (TB) in the closing part of the last century seemed to give in to modern drugs and treatment strategies evolved globally. But it has just delivered a shock in the form of a new “Total Drug Resistant” (TDR) variety that responds to no medicine. Putting the patient in a sanatorium as in the olden days may be the only way to handle such cases. The P.D. Hinduja National Hospital and Medical Research Centre in Mumbai has reported 12 such cases in the past two months, a first in the country, though this perticular form was spotted earlier in Iran. The treatment of the basic TB is simple — administer a WHO-specified course of antibiotics that runs for at least six months. But ensuring success is not as simple. Any disruption of the medicine, wrong dosage, or early discontinuation can result in the disease coming back in a form that resists many of the drugs available. That is called “Multi Drug Resistant” TB, a problem that is increasing, ironically, with the higher number of TB cases under treatment. A worse form is “Extensively Drug Resistant”, but that still has some treatment, even if difficult. The latest discovery of TDR TB should set alarm bells ringing. We may be on the cusp of a new epidemic, to which we may not have any immediate answers. What had brought hope was the Directly-Observed Therapy-Short Course (DOTS) programme launched by the WHO worldwide. It is based on having social or health workers directly supervise the administration of medicine to TB patients. But there are gaps in the programme, and also not all patients are treated under DOTS. Worse, many doctors too do not know the exact doses required for the treatment, as was found in many of the Mumbai TDR cases. What we have, thus, may even be called a manmade horror. While a review of DOTS is called for, we also need to guard against complacency in the implementation of a programme that has had phenomenal success thus far. Parliamentarians have already been declaring their assets in line with the law. It is a different matter that the big fish among them found a way to hide their wealth. Now the law covers all those associated with the power structure. Military officials may not find the law as inconvenient as the members of the judiciary. The reason is that the military is among the least corrupt institutions in Pakistan whereas the judiciary is among the most corrupt like the land administration and the education department, according to the latest study released by Transparency International. Yet the new law will add to the difficulties faced by the heads of both the military and the judiciary. While the fight between the judiciary headed by Chief Justice Iftikhar Chaudhry and the civilian government represented by the President-Prime Minister duo has been going on since the formation of the PPP-led ministry in 2008, the war of attrition between the government and the army began with the controversial declaration by a Pakistani-American that the then Ambassador of Pakistan in Washington had submitted a memo to a former US military chief on behalf of President Zardari to prevent a possible army coup. Since then there have been rumours about President Zardari being under pressure from the army chief to quit office. The army, however, could not dislodge the government because of its having been weakened during the past few years, particularly after the killing of Osama bin Laden on Pakistani soil. The latest move by the government, interestingly, shows that the democratic forces in Pakistan are straining hard to have the upper hand. Trust the government in general and the Ministry of Defence (MoD) in particular to disparage the armed forces’ image at the slightest pretext. In the last few years, this seems to have become a norm. The latest is the way a simple issue like the age of Gen V.K. Singh, the current Army Chief, has been made a highly controversial issue. It has been extensively debated in the media for nearly the entire tenure of the Chief, when it could easily have been sorted out as a matter of routine. Now, there is a sudden urgency to the issue as the MoD has peremptorily rejected the plea of the Chief, as requested by him through the medium of a statutory complaint and there is speculation that the Chief may take the issue to the Supreme Court. A simple case of when a person was born has been unnecessarily dragged into the public gaze because there are vested interests wanting to bring the high office of the Army Chief to such absurd levels where the issue of when the current incumbent was born has become a subject of speculation by the media and various self-appointed analysts, do-gooders and those wanting to please the leadership to meet their personal ends. Some loyalists of the government have even opined that the Chief should resign! Why should he when the MoD, including the person who presides over it, is to blame for this state of affairs? If any resignation is needed, it should be the persons who have brought this simple issue to this sorry impasse! The facts are simple and straightforward. There is ample documentary evidence that General Singh, the current Army Chief, was born on May 10, 1951. This includes his birth certificate issued by a military hospital; the date in his school leaving certificate; the date in the records of the UPSC; the records of the military academies from where he passed out — the NDA and the IMA — the records maintained by the personnel branch of the Army, Adjutant-General’s (AG’s) Branch; the records with the battalion to which he reported on commissioning; personal record entries in the numerous annual confidential reports (ACR’s) initiated every year and many more documents. However, the MoD, for reasons best known to it, persists in ignoring all this evidence and thrusting a date one year earlier — May 10, 1950 — as the date of the birth of the Army Chief. Why? Many have commented that this is being done because the powers that be are more concerned with who the next Chief should be in their reckoning and not the facts of the case. This consistent, albeit moronic, stance of the MoD is not only wrong but is also designed to denigrate the image of the General and show him as a self-seeking individual who wants to remain in office for a few months more! In this perverted milieu, neither the political leadership nor the bureaucrats of the MoD seem to be concerned with the highly adverse repercussions this whole episode is having on the honour, morale and wellbeing of an institution that continues to be the only one in the country that enjoys the continuing respect and confidence of the populace. It is also the only institution that is the ultimate guarantor of the security of the nation. Consequently, its honour and image need to be preserved at all costs, lest the country suffers on account of acts of omission and commission by a few individuals who seem to be more concerned about their personal interests and not the interests of the nation. The question of the present Chief’s successor should never have been part of the correctness or otherwise of the case — the date of birth — as it is extraneous to the issue under consideration. The rules relating to the selection of a new Chief are very clear. A panel is drawn up of the four or five seniormost Army commanders or equivalent and the government then selects one. Of course, in the past, the government has been selecting the seniormost Army commander, but that is because the government chooses to adopt the easy and non-controversial option of seniority and not the one of merit, although in the past there have been at least two cases where the seniormost was not selected. Be that as it may, it should never have been the reason for ignoring the mass of documentary evidence that confirms the Chief’s date of birth as May 10, 1951. The government can, in any case, select whoever it wants as the next Chief from the panel. If there is a fear that the seniormost will then retire in the normal course, even this can be pre-empted by giving him an extension as was done in the case of General Bewoor a few decades back. Many right-thinking persons in the country are wondering why the MoD has created this unseemly controversy when the documentary evidence is clear and incontrovertible. Having served for over 40 years in the Army and having held many appointments at Army Headquarters where dealing with the MoD was a frequent affair, I can venture to outline a few reasons. The foremost is that the MoD and, indeed, the hierarchy of the government want either pliable officers or yes-men to head the services or those who can be pressurised to do their bidding on account of extraneous reasons. Any elaboration is neither needed nor desirable. An independent-thinking chief of a service, who is likely to take a firm stand when he disagrees with what the government wants, as in his military perception it will harm the military and/or the nation, is a big “no-no” for them. At the heart of such thinking are three aspects. Firstly, the government has psyched itself to think that there is an ever-present danger of the military, especially the Army, as has happened in many neighbouring and Third World countries. This is despite the fact that no chief or any other officer of any service at any time since our Independence has shown even an inkling of such thinking. Such irrational thinking on the part of the government is not based on any facts or indicators, except the fear in the minds of the political leadership, which is periodically stoked by their so-called advisers for their own personal and obviously limited ends. Secondly, the hierarchy is happy with the status quo and has little time for a dynamic person who points out faults/inconsistencies and, in bureaucratic parlance, “rocks the boat”! While many civilian officials demonstrate their loyalty by being yes-men/women, irrespective of the merits of each issue, as long as their own backs are covered and personal requirements, dubious or otherwise, are met, the training and make-up of military personnel preclude them from acting in this manner. On a number of issues the present Chief has asserted his independent views and hence the hierarchy perhaps feels that the sooner he disappears from the scene, the better for them! They seem to be least concerned with what is correct, what is legal and what is good for the nation and the Army. Thirdly, such a hiatus is in consonance with the past actions of the government, where downgrading the military at every opportunity has now become a norm. This is apparently sought to be justified as strengthening “civil control”, but actually the concept seems to be least understood by our political leadership, irrespective of the party affiliations of the government in power at any particular time. Despite the technicalities advanced by the government, it is obvious that there has been little application of mind on this issue. This happens when bureaucratese supplants thinking and common sense! It is still not too late for the MoD to make amends so that faith in the correctness of the system is restored, at least to some degree. The writer is a former Vice-Chief of Army Staff. Our beloved Kapil Paaji very often uses ‘at the end of the day’ as a pause-filler. And somebody has blogged, “I vote” for “at the end of the day” to be banned. The most annoying sounds are not “like” and “whatever” but the talking heads on TV who use this pompous phrase endlessly. Some airhead repeating “like” is not half as annoying as one of the pseudo-intellectuals on TV news spouting “at the end of the day” 15 times in one analysis of events. Michael Erard in his book, “Um…Slips, Stumbles, and Verbal Blunders, and What they Mean” uses “disfluencies” for pause-fillers and other language bugaboos. He says that normal English speakers make seven to 22 slips of the tongue a day. Erard has also included Spoonerism in the “disfluencies” Spoonerism stands for words or phrases in which letters and syllables get swapped. Credit for it goes to William Archibald Spooner who was famous for making verbal slips. Once he toasted to Queen Victoria by asking “for three cheers for our queer old dean (dear old queen)” and greeted a group of farmers as “noble tons of soil”. 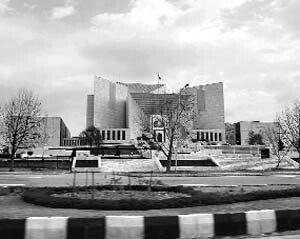 A view of the Pakistan Supreme Court. With such formidable facts, was Asma Jahangir — former counsel for Husain Haqqani — really serious when she argued that the Supreme Court should not hear and decide this case? Although the apex court is yet to give detailed reasons for its Dec 30, 2011, short order and the main memo-related cases are still pending, let us tentatively analyse the order`s context, determinations and implications. The memo case involved two main conflicts and three main players - Nawaz Sharif, the Pakistan People`s Party and the army - with different motives and strategies in requesting, or avoiding, a judicial inquiry and adjudication. This cntext is critical in understanding the order. Sharif has three interconnected purposes: to stay popular, to avoid a military-backed government and to form the next federal government by winning the upcoming elections. The memo case initiated by him provided a platform for starter solutions to these problems: it was a popular move, the petition took the initiative on the issue away from the military, and it provided an opportunity to either force or negotiate an early election with the PPP government before the purported `tsunami` of the Pakistan Tehreek-i-Insaf. In essence, the Supreme Court was called upon to conduct an adjudication of a political conflict involving constitutional issues. From the elite to the common man, it is an open secret that the de jure, constitutional PPP rulers share power with the de facto, unconstitutional military co-rulers in Pakistan. Regardless of the truth about the memo, the case provided a golden opportunity for the military establishment to further its policy of increasing its de facto power through political destabilisation. What better way to continue to remain a military-dominated security state than by accusing a civilian government of treason? At another time the military establishment would have imposed a coup (1958, 1969, 1977, 1999) or a soft coup using the presidency (1990, 1993, 1996), but history, society and the international context have moved on. So the Supreme Court was called upon to conduct an adjudication of an intra-state, inter-branch conflict involving constitutional issues. Unlike the hard and soft military-coup cases of the past, the military in this case was not asking for legitimacy from the courts for unconstitutional actions already performed but was instead seeking to increase its de facto power by using the judicial forum. It is in the above context that a deconstruction of the memo order leads to the determinations and implications that follow. To no one`s surprise, the court decided to hear and decide the memo case. Fragmentation, or infighting, amongst political and state actors breeds judicial independence. This case was a high point in judicial independence because the political and state elites were seeking the court`s intervention in resolving their conflicts. From Latin America to South Asia, judiciaries have adjudicated upon political and inter-branch conflicts. Therefore, there were no jurisprudential surprises here. The task of the apex court was helped by the fact that even the federation of Pakistan had not denied the existence of the memo and only "the origin, authenticity and purpose of creating/drafting of the memo" had to be ascertained. The high-level judicial inquiry commission formed for this purpose comprises three chief justices of the high courts for the obvious reason that it will be very difficult to question it. These judges are not only persons of high judicial calibre but have made professional and personal sacrifices during the lawyers` movement against unconstitutional military interventions. There are two more points to note. The Supreme Court has noted that "no separate reply has been filed by the President of Pakistan": one hopes the president`s legal advisers have told him about this part of the order, which has unpredictable connotations. Secondly, by holding that "prima facie, these communications form the most important piece of evidence", the court has attached a presumption of authenticity to the so-called evidence of Blackberry Messenger conversations, e-mails and telephone calls relied upon by Mansoor Ijaz and ISI chief Shuja Pasha. But the petitions in the case are still pending and will be "fixed by the office after receipt of the report from the commission". Therefore, after the submission of the judicial commission inquiry report within four weeks, it is the apex court which will decide these conflicts. In other words, the order is only a preview and the judicial drama is yet to be enacted. If only the PPP had adopted a legal rather than a political strategy in this case; if only Ms Jahangir and the government had not fought with the Supreme Court and claimed bias and had instead adopted a different strategy: to accept the court`s jurisdiction to decide this issue and to request it to form a more broad-based commission made up of judges, politicians, former bureaucrats and civil society persons to allay the perception of alleged judicial bias. But the moment has passed, and history is not a taxi one can stop at one`s own convenience. For the PPP to now survive before the courts, Babar Awan`s martyrdom has to be abandoned as a failed legal strategy. — By arrangement with Dawn, Islamabad. These days, for example, one has to create the space to be able to come up for air from the flood of information and/or speculation about a hundred points of concern that include general elections, Senate elections, the rather self-aggrandisingly named 'memogate' affair, judicial overreach, contempt of court notices, Swiss cases — and that's only this fortnight. Is Pakistan a failed state, a sponsor of international terrorism, is it a country on a suicide mission? Are the people starving, the industries and essential infrastructure in the process of shutdown, the long arm of the law proving hardly capable of facing the multifarious — many would argue self-created — challenges? Yes, it would certainly appear so. And yet … the poor souls on traffic policing duty, that most difficult and thankless of urban jobs, are still there every day, trying to create a modicum of order out of the chaos; I don't have electricity or gas or CNG for significant periods of time, but the choked sewer on my street did get fixed when I called the KWSB helpline; food prices may be higher than I remember having ever been, but the vegetable vendor is still happy to make a home delivery and throw in some choonga. It's a predictable and clutching-at-straws paean to a country that seems to be collapsing under the weight of its own sins; and yet, it must be noted. Behind the scenes, beyond the sound and the unspeakable fury that constitutes life in this country, there are things that continue to function as they should, as well as they can in spite of the very considerable hurdles. If there's anything that the Pakistani experience teaches, it is perspective. If there is a lesson to be learnt, it is to read between the lines and look beyond the headlines. If most of us live with the impression that in Pakistan, everything can change and yet nothing changes, there is a shred of hope to be found in the idea of behind-the-scenes shifts. So it was with an emotion not unlike surprise that I reacted when an advertisement that appeared in the Press on January 3 was pointed out to me. The public notice by the Sindh government informed us that it had vigorously been trying to implement a December Supreme Court order, as a result of which "the Commissioners of all Divisions in Sindh have been directed to locate the descendents property [sic] both movable and immovable belonging to the eunuchs and transfer entries in the relevant record of rights. Despite incessant efforts of the Deputy Commissioners, such properties are still untraceable. "However, CNICs have reportedly been issued to many eunuchs with the help of District Social Welfare Officers. Under the circumstances, the Government of Sindh has decided to publish the issue in daily newspapers … with the directions to eunuchs to approach the concerned Deputy Commissioners and District Social Welfare Officers to help in spotting their descendent property and settlement of their fundamental rights." Rights of identity and inheritance for 'eunuchs' (a lump-together term that Pakistan tends to apply indiscriminately to anyone from transvestites to hermaphrodites) is at first glance surprising for a country where the rights of women, children or, for that matter, any ordinary mortal, have proved notoriously hard to secure. And yet, beyond the first reaction, is the fact that people are people, regardless of age or gender. If the battle for women's rights or against child labour is to be meaningful in any fashion, it has to, of course, be accompanied by equal efforts on behalf of a numerically smaller but far more discriminated-against and even more marginalised and abused population. And that actually seems to be happening. To draw a parallel, the real-life situation of 'eunuchs' with regard to inheritance and voting rights is no different from that of many women who are similarly deprived. But under the eyes of the state and the law, women can inherit and vote. Through such changes, relatively behind the scenes since they do not attract the media spotlight that the political circus, for example, does, can greater gains be netted. n	In the report “Place where Bhanwari’s body was burnt identified; 1 more held” (Page 2, Janaury 5) in the intro para ‘disposed of’ has gone as ‘disposed off’. Also in the report ‘today morning’ should have been ‘this morning’. n The use of colon in the headline “To Badal’s complaint, CEC retorts: We know our limits” (Page 1, Jan 4) is inappropriate. n In the report “PM pays obeisance at Golden Temple” (Page 2, January 2) there is a reference to the Prime Minister being presented a gold-plated portrait of the Golden Temple. Portraits are of people not of monuments. n In the report “Defence Ministry rejects Army Chief’s plea on age” (Page 1, December 31) the sentence “The Army Chief in his complaint had asked the minister take a decision…..” should have had ‘to’ between the minister and take.